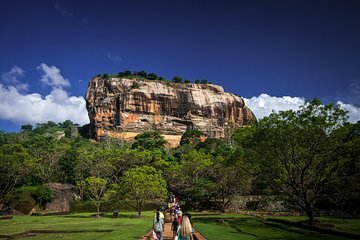 If you have time for one day trip from Colombo, Sigiriya Rock should top your list. This UNESCO-listed rock boasts a 5th-century fortress and wall paintings, but is difficult to visit in a day independently. This private tour makes it easy, with private transport, a personal guide, and a visit to the Dambulla Cave Temple on route. Breakfast, lunch, entrance fees, and hotel pickup and drop-off are included. So happy I got the chance to visit Sri Lanka: a beautiful small country with warm and welcoming people. Both Sigiriya rock and Dambulla Temple are must sees. From the capital, took us about 4h to reach Sigiriya by private deluxe mini-van. The history around Sigiriya is quite nice and the views are breathtaking. So are the more than 1000 steps to climb up to the top... All worth to see the view and the paintings in the caves. Our driver Mohammed did his best to drive us safely and comfortably in the long itinerary from Colombo. The guide in Sigiriya was also very knowledgeable and patient. 10 out of 10. The trip was fantastic. My drive/guide, Sugantan, was fantastic. I was traveling alone, and he graciously kept me company and was flexible enough to adapt the itinerary during the day. He was open and happy to entertain any questions I had about Sri Lanka. I booked this tour during my business trip to Sri Lanka. Overall, the experience was great. Big thanks to my tour guide and driver, Anthony from Recharge Tours who was punctual, helpful, and friendly. One of the greatest thing he did was trying to arrange the journey in order to give me enough time to cover all the point of interests with sufficient time. He also has good local knowledge of the attractions, and has a great sense of humor. Thanks to Anthony. I will definitely recommend Anthony to my friends who plans to visit Sri Lanka. As a solo traveler, the trip was amazing! My guide Sugan was a pleasure to be around, a great driver, and went out of his way to ensure I had a great Sri Lankan food and sightseeing experience. Dambulla's Golden temple was unique and worth the stop, but the real prize at the end of the day was Sigiriya! Truly one of the most unique places I have ever been and photos really do not do it justice. A little crowded on a Saturday afternoon as you made your way to the top, but the views and the history are truly priceless. Sugan the driver really put together a great itinerary and ensured every single need was met along the way. This tour was great. Very authentic. The driver was very attentive to our needs. Great value! A must do in Sri Lanka, especially if you don't have much time.